Click this link to download a printable PDF (4pp 1.2MB). 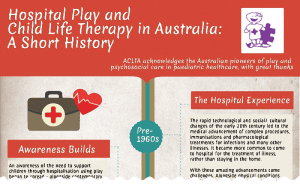 In June 2014, thanks to the generous support of Australian children’s cancer charity Camp Quality, ACLTA (then AAHPS, Australian Association of Hospital Play Specialists) held a Strategic Forum on Hospital Play in Australia. Representatives from all states and territories (except NT), and from a range of child life therapy services (Children’s Hospitals, sole practitioners, private practice) came together to set the course for the Association, and profession, in the coming years. One of the agreements of the Forum, which was later passed by ACLTA Member Vote, was to unify professional and association titles. Up until this point, there had been many titles to describe the role across Australia – including play therapist, educational play therapist, hospital play specialist, and play coordinator. This led to confusion and difficulty in evolving the profession. ‘Child Life’ is the professional title used throughout USA, Canada and many other countries. It is internationally recognized and associated with the growing body of evidence demonstrating the efficacy and benefits of therapeutic play and psychological preparation for children in healthcare. By aligning with the professional title of Child Life Therapist (and collectively as the Association of Child Life Therapists Australia), we recognise the full scope of our evidence-based practice, and provide an opportunity to strengthen our identity. The Association declared its “Switchover Date” for this title change was as of 17 November 2014. ACLTA understands it may take time for services and professionals to change their titles at individual healthcare facilities. We encourage ACLTA Members particularly to show leadership in this process, and create opportunities for discussion about the title change – whether that be between child life therapists, Hospital Executives, Allied Health and Nurse Unit Managers, team leaders, other healthcare professionals, and the children and families we serve. In order to assist with these discussions, the Executive have compiled some resources that may assist in these discussions and changes. Some of these are listed below, however please also refer to the Recommended Frameworks page and Association Documents page. Download the ACLTA Framework: Scope of Practice for Child Life Therapists in Australia (including Assistant, Practitioner, Senior Practitioner and Manager levels). This may assist in redrafting/creating position descriptions at facilities, so they are in unison with other child life therapy positions across the country. Read the American Child Life Council’s Evidence-Based Practice Statements. While ACLTA did not create these documents, these Statements make clear “why we do what we do” as Child Life Therapists (and may be helpful for showing others why we are aligning with a title that is used in the USA/Canada). Download and distribute ACLTA’s free, printable flyer about our profession, entitled Child Life Therapists in Australia (PDF 432K). Need guidance and support? Contact the ACLTA Executive via the Contact Us form on this website to be put in touch with your State/Territory Representative. The ACLTA logo mascot, a calico medical play doll. Child Life Therapists use dolls like Dot to help children understand hospital procedures – be that medication taking, blood tests, NG tube insertions, x-rays or CT scans! Calico dolls can be drawn on or decorated in whatever way the child wants; and provide an alternative to using precious teddies and other soft toys. Child Life Therapists around the country often rely on generous donations of calico dolls from community groups and individuals in order to have enough dolls for their work. If you feel you can assist, and would like to contribute dolls or materials, please contact the ACLTA Executive via the Contact Us form on this website, to be put in touch with your closest child life therapist.